Yellowstone With an Oriental Twist (published by the MWSA 2017 summer edition) - The Works of Joe Campolo Jr. In 2012 my wife Ann and I made plans to visit the American west. Having been impressed by the Tetons while driving out that way on several occasions I wanted to see them again. 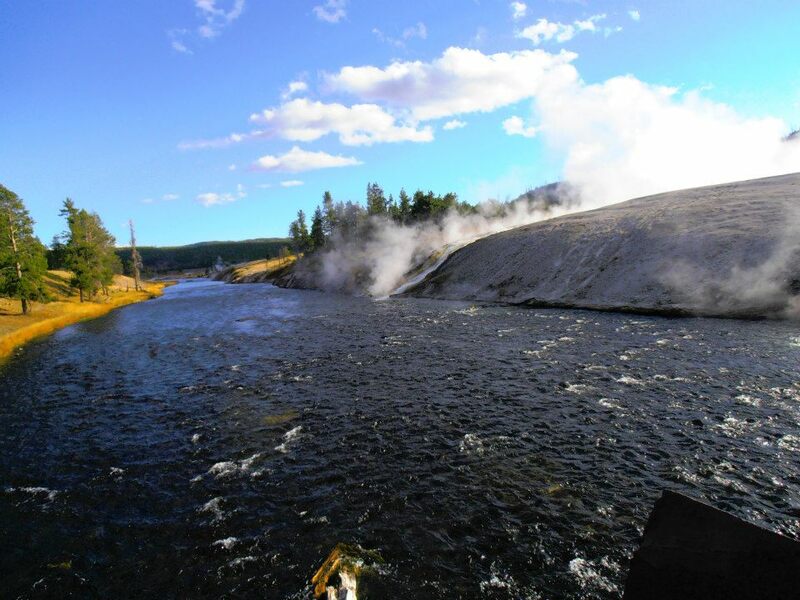 I also wanted to visit Yellowstone National Park which I had not seen. Digging through our options we found a bus touring company owned and operated by an outfit in mainland China. They conducted tours all over the U.S. as well as other scenic destinations around the world. And since I’m a cheapskate, the very reasonable cost of the tour got my attention. 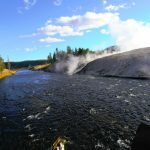 They offered several tours out west, with Yellowstone being an option in three or four of them. 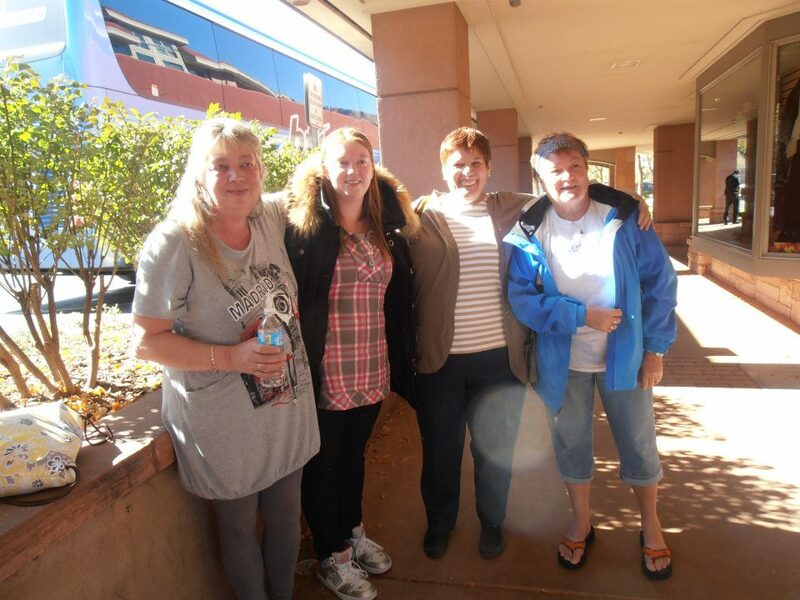 We elected to take a 6 day tour which started in Denver. After flying in from Milwaukee, we met our tour group at the Denver airport. 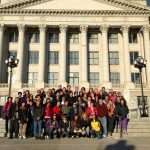 The group boarded two brand new Mercedes Benz coaches and then headed for our first tour destination at the Colorado capitol building in downtown Denver. 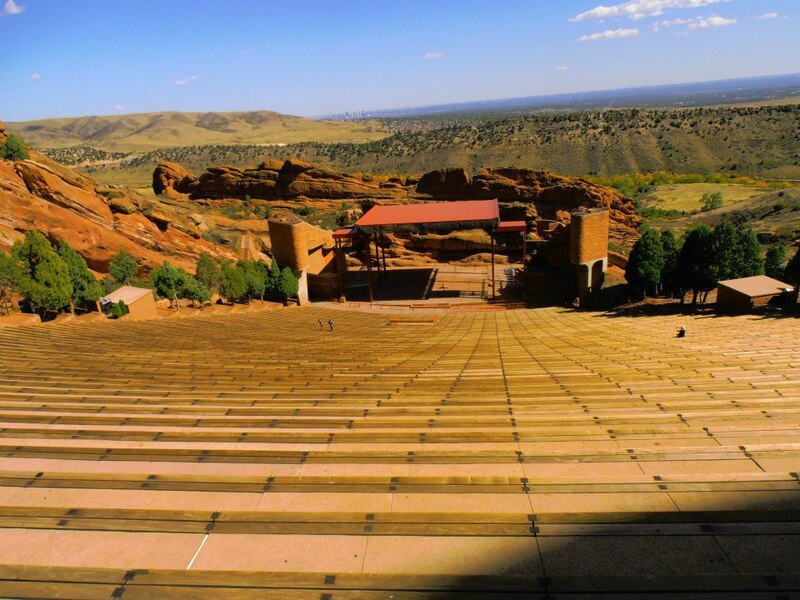 We then visited the Red Rock amphitheater on the outskirts of Denver before returning downtown where we had dinner, after which we checked into our hotel. Leaving very early the next day we drove through Colorado, into Wyoming and up into South Dakota. 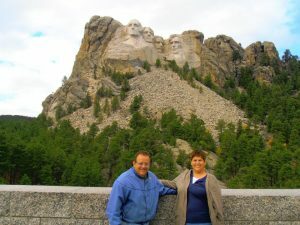 While there we visited Mt Rushmore and the new Crazy Horse national monument. The next day we headed west through Wyoming, touched into Montana and Idaho for a bit, and then turned south to Yellowstone. We spent two days in Yellowstone and a half day in the Tetons. Departing the Tetons, we headed for Salt Lake City where we visited the Mormon Tabernacle and the Great Salt Lake. Leaving Salt Lake City our next stop was Arches National Park where we spent the better part of a day. From Arches we went on to tour the Kennecott Copper mine, after which we turned east. Our first destination back in Colorado was Glen Wood Springs. From Glen Wood Springs we headed down for a visit in Aspen, then back to our starting point at the Denver Airport; and an end to our very busy six day tour. Ann and I enjoyed the trip very much. 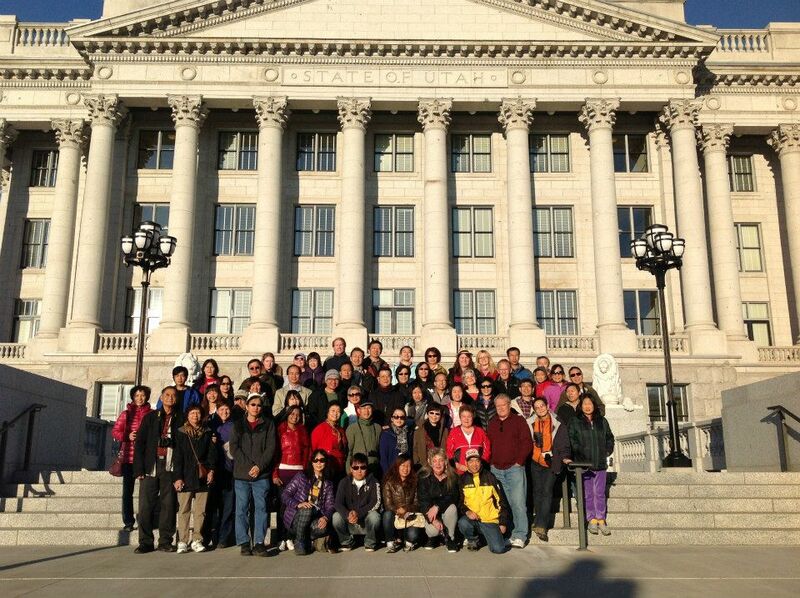 About seventy five percent of the people on the tour were Chinese; mostly from main land China. There were a handful of Americans, a couple of people from South America, a few people from Canada and several from Europe. The bus drivers and the tour guides were Chinese. The tour guide on our bus, “Roger”, was quite impressive. He spoke perfect English and had in depth knowledge of all the areas we toured. He possessed a talk show host’s personality and kept us entertained and informed throughout the trip. He was also a bit of a drill sergeant, taking anyone to task who didn’t return to the bus on time. The Chinese take their touring seriously! One thing we learned quickly on this trip; do NOT get between the Chinese guests and the buffet line. The lodging was included in the trip and was selected ahead of time by the touring company. (Based on low price I’m quite sure) Every meal was a buffet and the Chinese descended on the buffet lines like hordes of locusts. They didn’t actually push anyone out of the way that I saw, but I’m quite sure if anyone would have fallen they would have been trampled to death. Getting on and off the bus for touring stops, dining or rest room visits was also a challenge thanks to the Chinese guests. Rather than depart orderly from the front of the bus, they all bull rushed at one time and it was every man (and woman) for themselves. As in the case of the dining, we learned how to deal with this also. We would let them all rumble off the bus prior to our departure. We also came back a little early so as not to get caught in the return stampede. Roger would give two sets of talks for every occasion; one in Chinese and one in English. Fortunately for most of the guests from Europe and South America, they had a fine command of the English language. The Chinese from mainland China did not…and they jabbered to each other continuously throughout the trip in their native tongue. My wife and some of the other tourists were somewhat put off by this, especially on the bus and in close quarters. Having spent a year in Vietnam I was accustomed to the sing-song tone of the oriental language. There were some rules we had to adhere to that were in-flexible. One rule was getting back to the bus on time between stops and morning departures. First time offenders would be forced to sing a song for the whole bus upon their arrival; repetitive violators would be thoroughly chastised in front of God and everyone. Another rule, one which was very unpopular but rigidly enforced, was the bus restroom policy. Although there were two very nice restrooms on each bus; we were prohibited from using them. Tour management did not want to incur the cost… or time of cleaning the restrooms. So all of our restroom requirements were dealt with as soon as we got off of the bus; contributing to the previously mentioned stampede. One hapless fellow from China, who was experiencing digestive issues, had no choice but to use the restroom on the bus between stops. Roger had no sympathy for him and harshly chastised and embarrassed the poor man in front of the whole bus. Aside from the annoying restroom policy, the trip was very enjoyable and interesting. 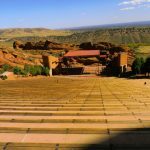 I learned more about the many places we visited, listening to Roger than I had at any previous time in my life. Roger was also a gentlemen and a good sport about helping out with luggage, photographs, and other things that came up. So it was easy to cut him some slack on the bathroom and tardy lectures. Winter comes early to Yellowstone and as our trip took place during the last week of September and the first week of October, tours were coming to an end. Ours was the last of this tour for the year as soon the roads would become icy, the lakes and ponds would freeze over and the vegetation would go dormant for the year. Heavy jackets were required outdoors, especially in the early morning. The scenery at this time was spectacular, however, with autumn colors at peak. Steam rolled off of the lakes and ponds, the bison and elk were now rutting and frisky as they engaged in their pre-winter mating rituals. Bears were fattening up, preparing for their long winter hibernation. It was kind of sad knowing we would be the last ones through until next spring, and I believe it gave us an additional appreciation of everything we were able to see. The Tetons were spectacular as always, and we gazed at them till the bus was out of site, on its way to Salt Lake City. The Mormon Tabernacle was also spectacular, the architecture marveling and inspiring. Having lived next to Lake Michigan most of my life, the Great Salt Lake was not as impressive to me as it was to some of the other guests. 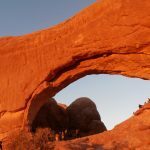 Devoid of fish, I sure didn’t see what the big deal was and had no problem departing there for our next visit at Arches National Park. 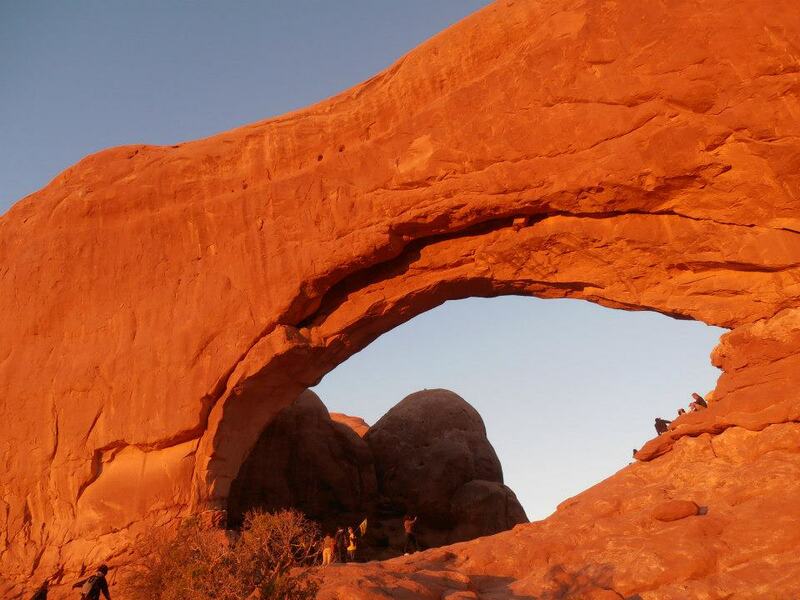 Arches did impress me, with its stunning rock monuments in various shades of brown and orange. We climbed among them throughout the better part of a day; with some of the younger generation of the tour group scaling them like mountain goats. Looking toward the horizons, it seemed that spectacular rock outcroppings resided as far as the eye could see in the eighty thousand square acre park. 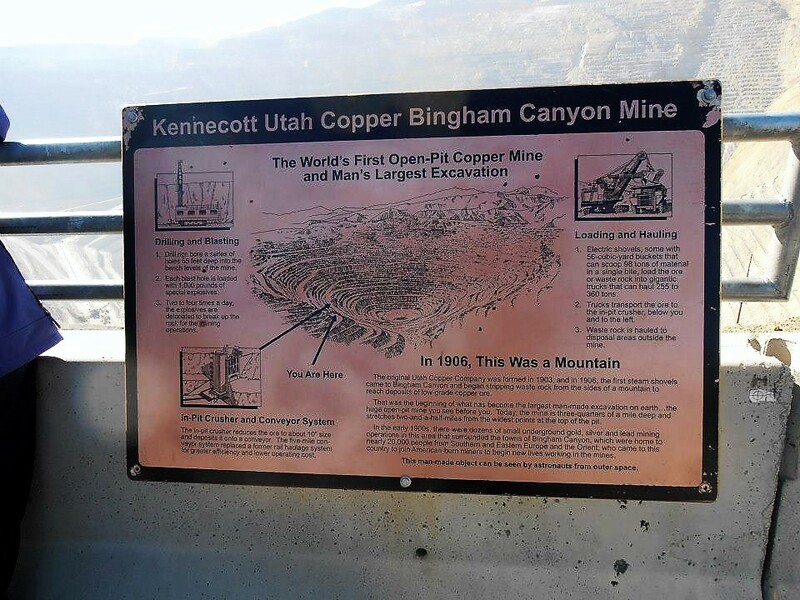 Upon leaving Arches, Roger informed us that we were on our way to a large copper mine. 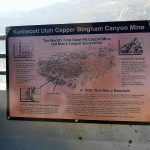 After his discussion about it we eagerly awaited our visit to Kennecott Copper Mine in Utah; the largest open pit mine in the world. Although this was not one part of the trip I had thought much about, after the tour it was certainly one of the most impressive, and my personal favorite. The scale of the mine is unfathomable; and yes, it truly is visible from space. The remainder of the tour was anticlimactic; the ski resorts in Western Colorado were very scenic, though not on the same level as Yellowstone and some of the other areas we had visited. It was a nice winding down of the six day jaunt though, and we reentered Denver satisfied and relaxed. We took some additional photos at the airport and said our goodbyes and exchanged contact information with many of the people we had toured with. Roger had given us a sales pitch on some of the other trips the company offered toward the end of the tour, and suggested discounts were available for those who signed up quickly. During the first part of the tour, Ann and I had befriended a young girl from Brazil who was traveling alone. Somewhat shy, she joined us on the various tour stops and for dining. After a few days she made friends with some of the other young people in the group and overcame her shyness. Our goodbyes with her included a lot of hugs and a few tears. Several weeks ago Ann and I started reminiscing about that trip, and are now tinkering with the idea of taking another one. 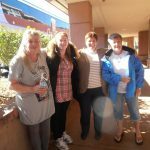 We wouldn’t mind hooking up with the same touring company again…now that we know how to muscle through a buffet line and exit a bus in fifteen seconds or less!